Ahmed Hoosen Deedat (July 1918 – 8 August 2005) was a South African writer and public speaker of Indian descent. 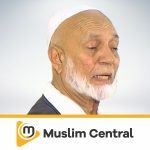 He was best known as a Muslim missionary who held numerous inter-religious public debates with evangelical Christians, as well as video lectures, most of which centred on Islam, Christianity and the Bible. He also established the IPCI, an international Islamic missionary organisation, and wrote several booklets on Islam and Christianity which were widely distributed by the organisation. He was awarded the prestigious ‘King Faisal International Prize’ in 1986 for his 50 years of missionary work. One focus of his work was providing Muslims with theological tools for defending themselves against active proselytising by Christian missionaries. He used English to get his message across to Muslims and non-Muslims in the western world. Discover more series by Ahmed Deedat.